Berkeley, CA â€“ 5 December 2011—Fans anticipating the first deluxe hardcover volume of Nick Spencer and Joe Eisma’s critical darling, MORNING GLORIES, will have to wait a little longer to get their heart’s desire. 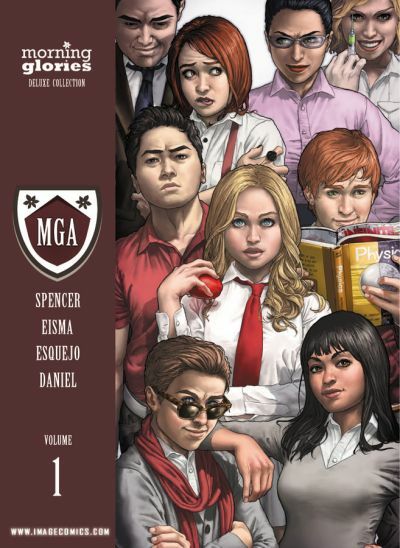 While Image Comics and Shadowline regret the delay caused by a printing error, they are committed to making this handsome collection of one of the best selling and most critically acclaimed series just right. Initially scheduled to be on sale November 30th, the book was pulled from this week’s shipments. The publisher is now working with the printer and distributor to fix the error and expedite reshipment of MORNING GLORIES, HC VOL. 1. The corrected version is expected to be back in stores by the end of December. Fans have a full course load of extras to look forward to in this gorgeous deluxe collection that no collector or fan of the series will want to be without it. Collecting the first 12 issues of the enigmatic story that Time called “the sort of premise you might associate with an ambitious TV show rather than a current comic book”, plus every MORNING GLORIES cover by Rodin Esquejo, a foreword by Damon Lindelof, Executive Producer of Lost, and sketches and character studies from Esquejo and Eisma make this a must-have edition! In the meantime, both trade paperback volumes are available for retailers to reorder and the next issue, MORNING GLORIES #15, will be on sale December 21. The entire series is also available to purchase day-and-date from Image Comics’ digital partners. MORNING GLORIES, HC VOL. 1 (SEP110417, ISBN: 978-1-60706-430-5), a 400-page trade paperback collecting the first twelve issues of the runaway hit series will be available in stores $39.99. MORNING GLORIES, TP VOL. 1 (DEC100470, ISBN: 978-1-60706-307-0) and MORNING GLORIES, TP VOL. 2 (JUN110483, ISBN: 978-1-60706-407-7).